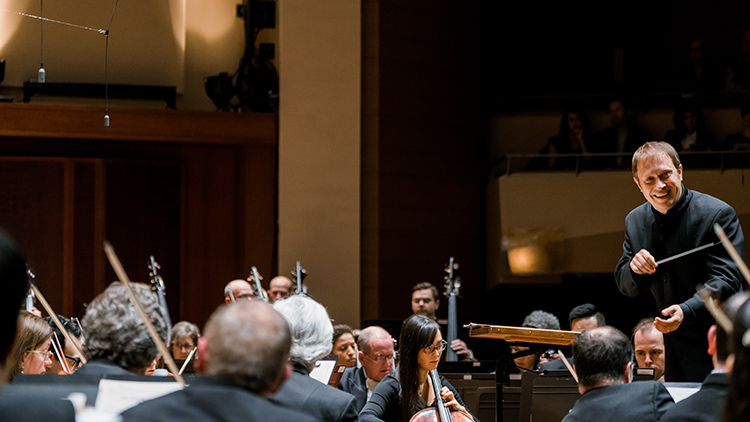 From the concerts on stage to community and education programs that reach beyond Benaroya Hall, the 2016–2017 season was filled with highlights. Reflecting on the music we’ve heard this season, music new and old, we'd like to share highlights with you. It’s been a thrilling year and we hope you enjoy thinking back to your own favorite memories of the season. The concert experience relies on you — thank you for your enthusiasm and support. 2015 Piano Competition winner Kevin Ahfat joined Associate Conductor Pablo Rus Broseta for the Shostakovich Concerto Festival in January. Partnering with local nonprofits, in early February the Symphony presented All of Us Belong, part of the Simple Gifts project, pairing Ives’ New England Holidays with poetry and visual elements, created and inspired by individuals experiencing homelessness. A full house and more than a million people online experienced Music Beyond Borders, a free concert in February celebrating the diversity of our world through the musical traditions of Iran, Iraq, Somalia, Sudan and Syria. In March more than 10,000 third through fifth graders played recorders and sang with the orchestra at the culminating concert of Link Up: The Orchestra Sings. This curriculum provides the building blocks for a lifetime of creativity through music. Ludovic Morlot and the orchestra completed the two-year Beethoven Cycle, during which they performed all of the composer’s symphonies and piano concertos. The composer's renowned Symphony No. 5 capped the cycle in late March. This season the Symphony launched a new series of Sensory Friendly Concerts sharing the joy of music with children affected by autism spectrum disorders. During the Merriman Family Young Composers Workshop, composer Aaron Jay Kernis, in town for the U.S. premiere of his new violin concerto, hosted a master class with student composers in March. This season of tremendous musical moments would not be possible without donations made by generous people like you. Make your charitable donation at seattlesymphony.org/give or call us at 206.215.4832.